John in the opening of his gospel has a beautiful poem. It speaks about the eternity of God, the Word’s participation in creating the world, the Word’s activity in the world and in Israel and then John addresses the incarnation of the Word. It begins with the quoted verse, the Word, the Divine Word that is, became flesh and made His dwelling among us. The Divine Word became human, and like God who dwelt among the Israelites, in the wilderness in a tabernacle (Exodus 25:8-9) in Jerusalem in King Solomon’s temple (1 Kings 8:20-13) made His dwelling among us, this time as a human, Jesus of Nazareth. This is the heart of the Christian mystery and it is what makes us children of God. God the creator of the universe has become part of creation. We see His glory, His full revelation, His awesome presence, we see God himself. 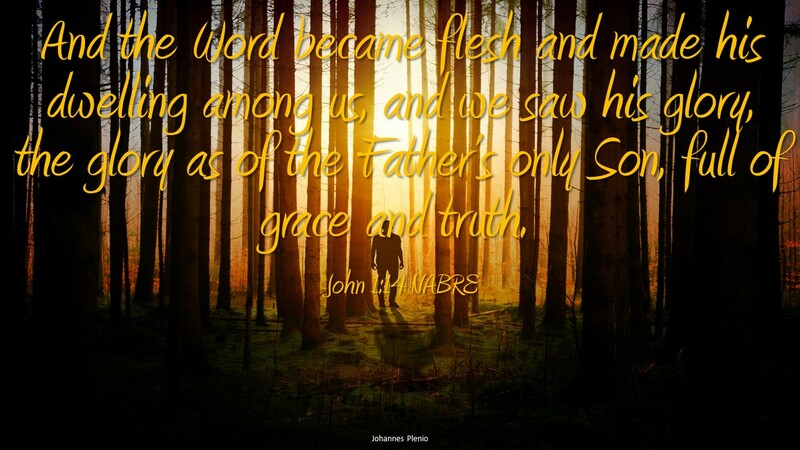 In the past God was seen as smoke or fire or some symbolic image, now God is the same flesh as us, “emptied and in the form of a slave.” (Philippians 2:6-7) He is the Father’s only Son, full of grace and truth. He is a Son who is loving-kindness and faithfulness, He is blessed and remains the truthful Word of God throughout eternity. God becoming human like us, becoming a son of Adam like us, bringing our humanity and God together in a familial way, all children including His Son. The Word is a living witness to what God has spoken into the world from the beginning of creation. We share in Jesus Divine life and we are told this is the truth of God’s Word. We should make every effort to accept our divine sharing in the Word and live as children of God, sharing the message of love. Do you claim your life as God’s child? Do you live as though the Word is alive in you?